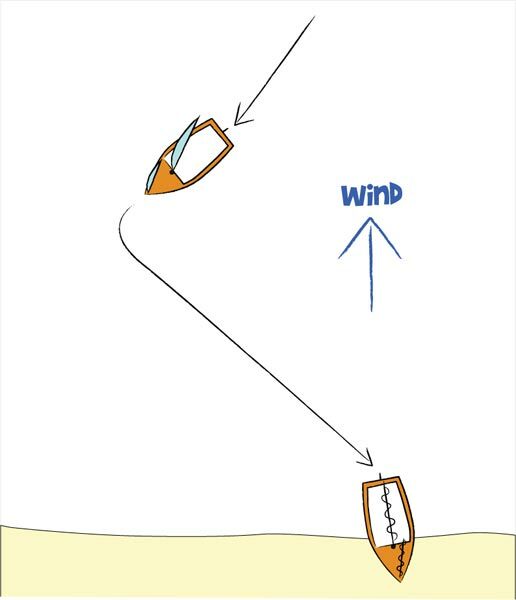 Landing a dinghy isn't as simple as just aiming for the shore - depending where the wind is coming from, you need to take a different approach. This can be quite dangerous; if there are heavy winds behind you, as you approach shore, you can quite easily ground the boat, and when grounded the boat can be blown on top of you. To come ashore on a shallow shore (see Fig 1), when the water is shallow enough to stand, turn the boat head to wind. It should now be pointing away from the shore; the helm and crew should lower the sails, get out, and pull the boat to shore. In deeper water, there is a safe approach and a fast approach. 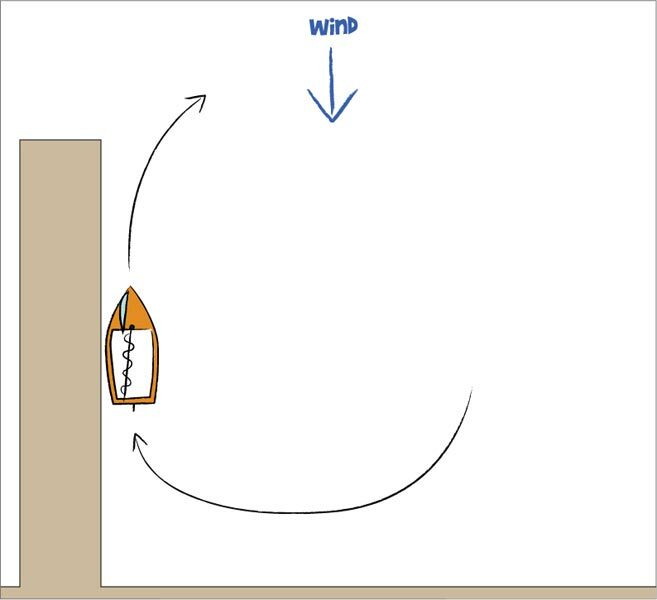 The safe approach is to come close to shore, turn head to wind, and lower the mainsail (see Fig 2). Then, gybe or tack and approach the shore using the jib alone, raising both centreboard and rudder, and at the last moment letting the jib flap and the boat drift in. 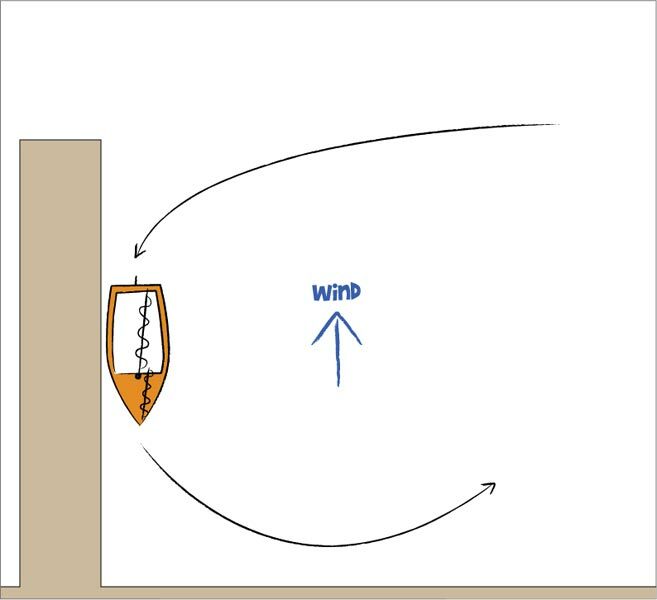 The fast approach, useful for when in large waves or dangerous conditions, is to approach the shore fast on a broad reach, and at the last moment raise the rudder blade and centerboard (see Fig 3). Before the boat hits the beach, the crew and helm jump out on the windward side of the boat, and pull the boat up to the beach, turning it head to wind to lower the sails. This should be used only when absolutely necessary due to the increased chance of grounding and damage to the boat if carried out wrong. 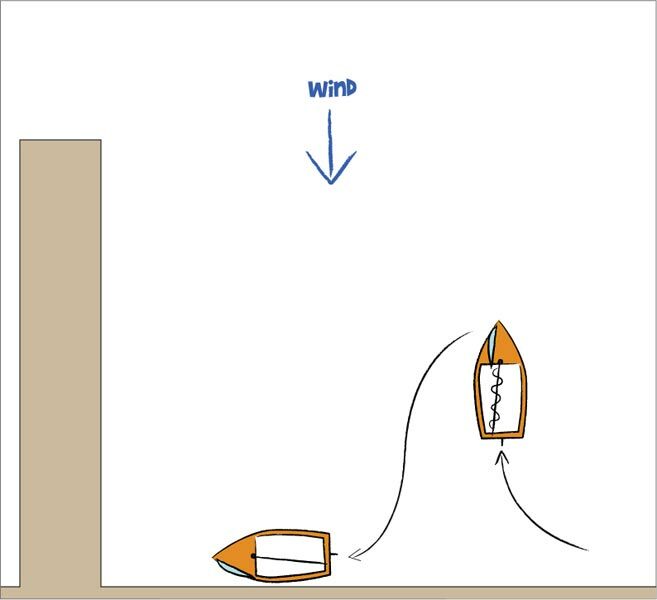 When arriving at a pontoon, if the pontoon is parallel to the shore (at 90 degrees to the wind) come close to the pontoon, turn head to wind and under the jib alone allow the boat to drift alongside the pontoon (see Fig 5). If the pontoon is at right angles to the shore (pointing straight out), sail on a broad reach to close on the pontoon, then turn head to wind to stop alongside (see Fig 4). 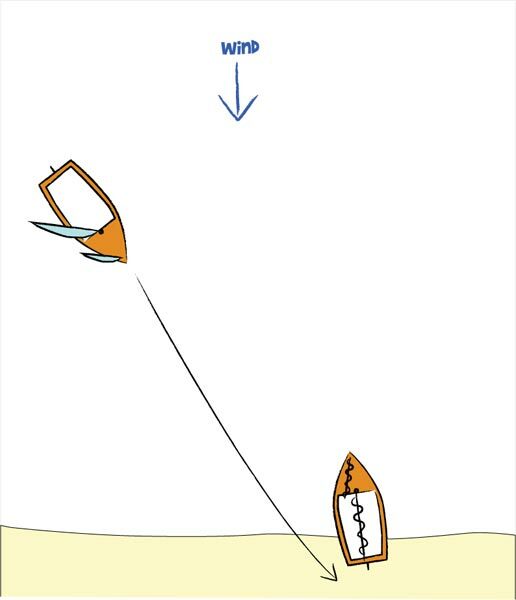 Alternatively, lower the mainsail and use the jib to do this more carefully. 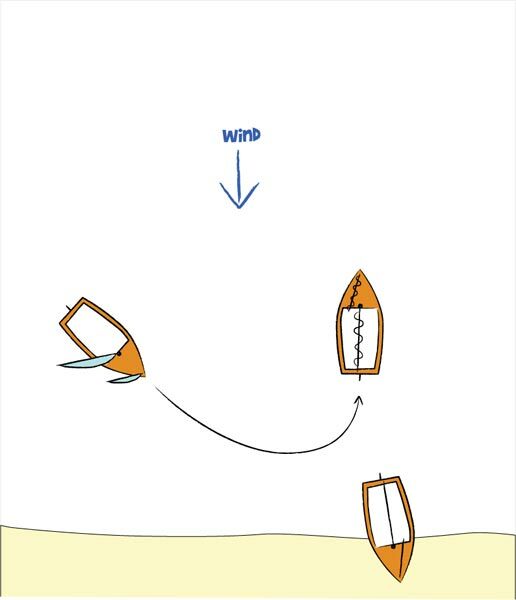 This is the easiest situation; because the wind is coming off the shore, you should ease the sails out as you tack towards the shore, and then before reaching the shore when it is shallow enough to climb out, turn the boat head to wind to slow down and stop the boat, raise the rudder and centerboard, ideally before being grounded (see Fig 7)! The crew should hold the boat steady, and the helm should lower the sails. 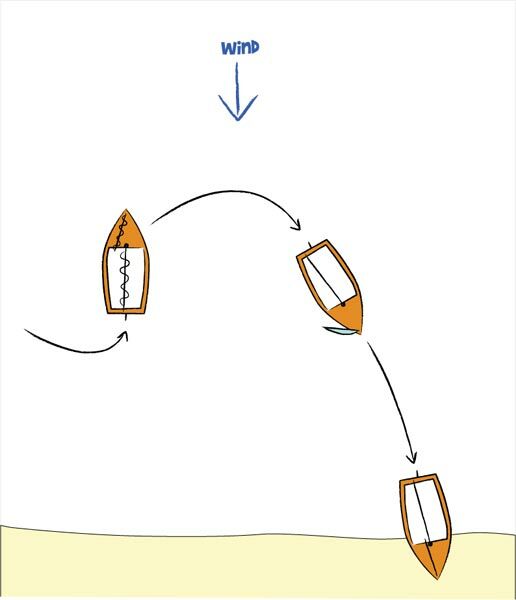 If the water is deeper, tack towards the shore, then when several boat lengths away from the shore, tack onto a course parallel to the shore, then when appropriate, turn head to wind to stop as close to the shore as possible (see Fig 6). 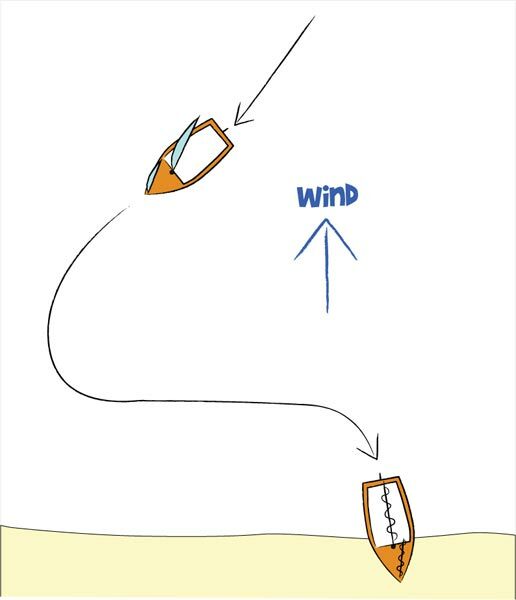 When landing on a pontoon in offshore wind conditions, a similar approach is required; approach on a close hauled course, then turn head to wind just before reaching the pontoon to come alongside it and stop (see Fig 8).